​On Saturday December 12th Santa Clause made his stop in Mazeppa. He arrived at 10:00 am to find out what the area kids wanted for Christmas. By 11:00 the soup and chili was ready to be served ! The MAHS had a wonderful turn out and everyone enjoyed the soup and chili made by Charlie's Eatery and Pub. At 1:00 the raffle drawing was held and the winner's are listed below ! The MAHS would like to thank everyone for making this event a success ! 8. Motorola Talk-a-bout 2 way radio- Moto Proz Inc.
​“Preservation” is the goal of the Mazeppa Area Historical Society whether it is history or the building. To preserve and restore our building to a point where it can be put on the National Registry of Historic Places. The MAHS plans are to attempt to expose some of the unique exterior features of the old Peoples State Bank which was built in 1909 & now serves as the museum. 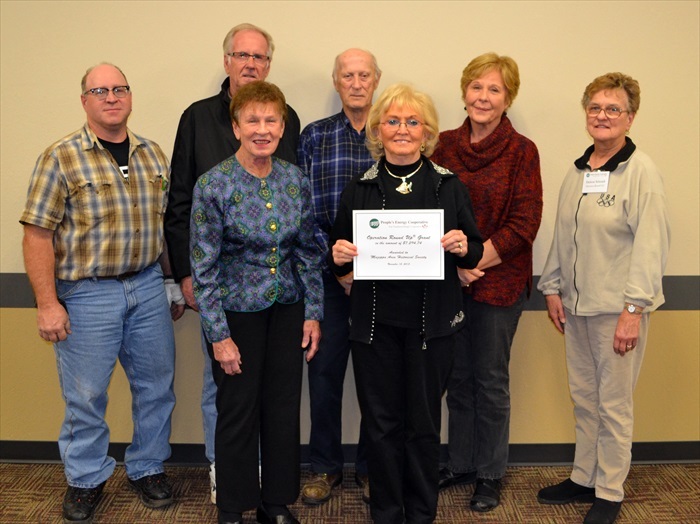 The Mazeppa Area Historical Society recently applied for a grant from the People’s Energy Cooperative in Oronoco from their Operation Round-Up and were recently granted $7294.74. Reception was held at the People’s Energy Cooperative on November 12 and was presented a certificate of the amount. The project will take place in 2016 with the organization looking for volunteers to assist in various projects and as we proceed with the restoration more funds will be needed. The MAHS is so grateful for the generosity of the People’s Co-op and their Operation Round-up program. ONCE OUR HISTORY IS GONE- IT IS GONE SO LET’S PRESERVE OUR RICH HISTORY! The Mazeppa Area Historical Society is placing a Time Capsule in the new bridge, that is being constructed on highway 60 on the west edge of Mazeppa. The bridge project is being constructed by ICON Construction of Mable MN. "Duff" Bement is the MNdot inspector that worked with the MAHS to place the time capsule. The historical society decided to make the capsule shortly after learning of the two bridge replacements on HWY 60 in Mazeppa this summer. The MAHS wanted to make the time capsule to show people in the future, what life was like back here in 2015 ! The items in the capsule included a few issues of the local newspaper "The Messenger", Post Cards showing Mazeppa in its "Glory" days, a couple of "cell" phones, a couple of "flash drives" that contain many pictures of present day Mazeppa. Also, are videos of Mazeppa Daze parade and other activities. Some other documents of the MAHS were also included. If they are able to read these flash drives in the future is unknown ! If nothing else they will see what devices we used for Data storage in 2015 ! 90 plus ZM students gathered at the Mazeppa Cemetery on May 6 for Community Service Day. Students along with the direction of Staff assisted in general clean-up of the grounds and washing down of cemetery monuments. ZM "muscle men" also assisted in straightening some large monuments where the young men's strength came in handy with the spade, lifting, pushing, and carrying pails of crushed rock. The Mazeppa Area Historical Society and Mazeppa Cemetery Association greatly appreciated the enthusiasm displayed by the students and organizing skills of the staff. This group of ZM students really made a difference! 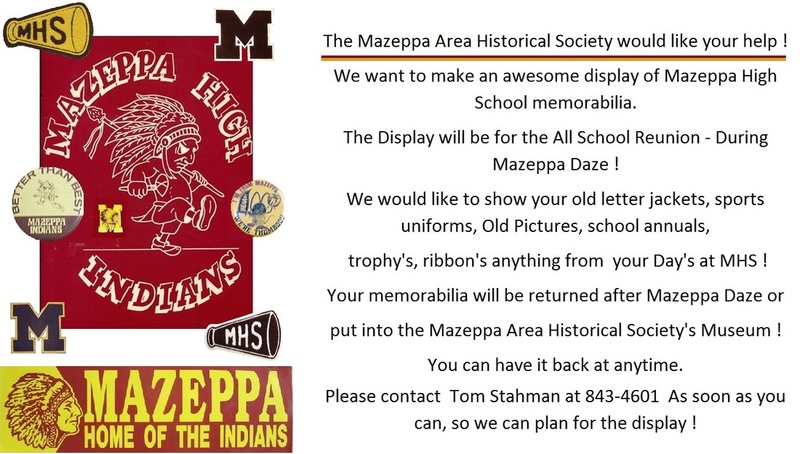 The newly formed Mazeppa Area Historical Society would like to invite you, to join them in creating a place to share our memories, photos, and memorabilia of the past, present and future to be enjoyed and preserved by the Mazeppa Community and its visitors to the area.